Sphaerobunus singularis, from Mello-Leitão (1935). 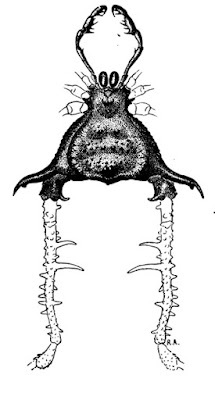 Sphaerobunus is a genus of gonyleptid harvestmen found in southern Brazil, males of which possess a large transverse apical apophysis on coxa IV and a comb of very long spines on femur IV. Characters (from Kury 2003): Femur IV of male with internal sinusoid comb of very long spines; coxa IV of male with long, transverse apical outer apophysis; free tergites II–III of female with stout unpaired cones. [K03] Kury, A. B. 2003. Annotated catalogue of the Laniatores of the New World (Arachnida, Opiliones). Revista Ibérica de Aracnología, volumen especial monográfico 1: 1–337.